So here we have a couple of TYGA project bikes. 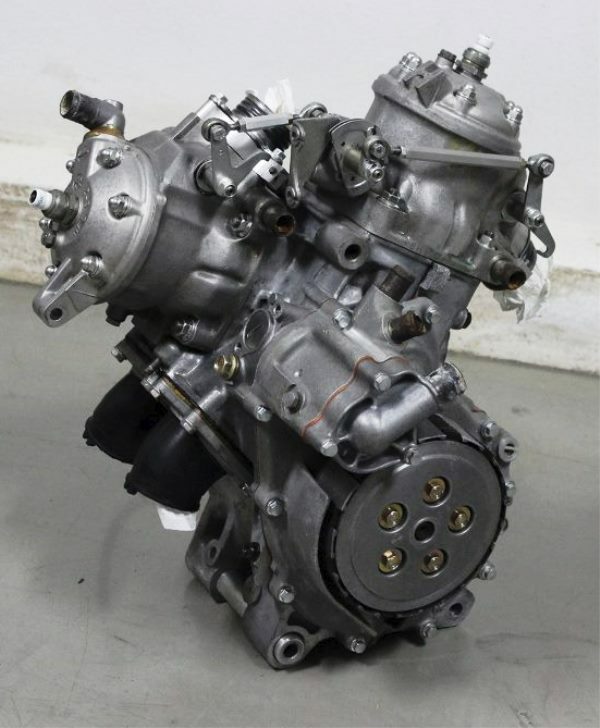 Granted, there are not many TYGA parts on them but they are dear to us and, at least in the case of the 1990, completely restored by TYGA. 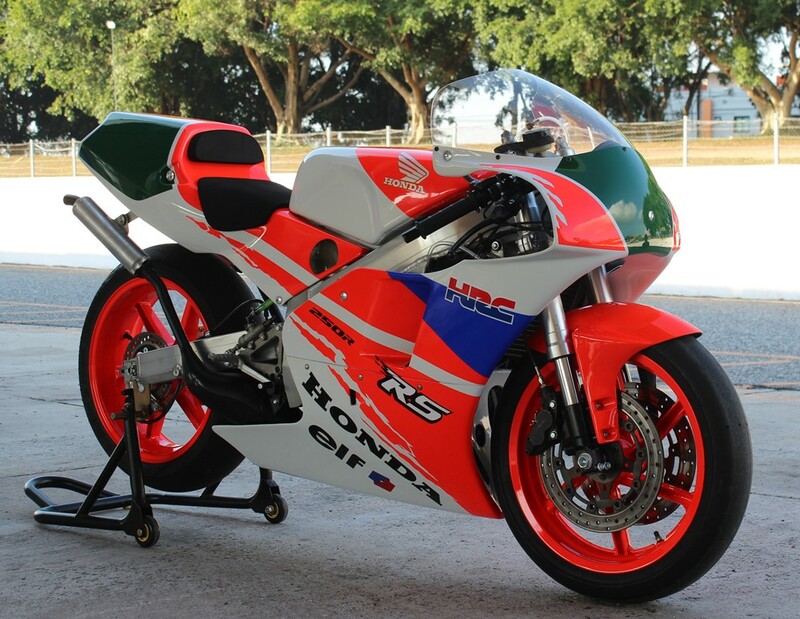 Back in the exciting early years of HRC, it seemed like barely a year went by without there being a significant update or new model 250 GP bike from Honda racing division. 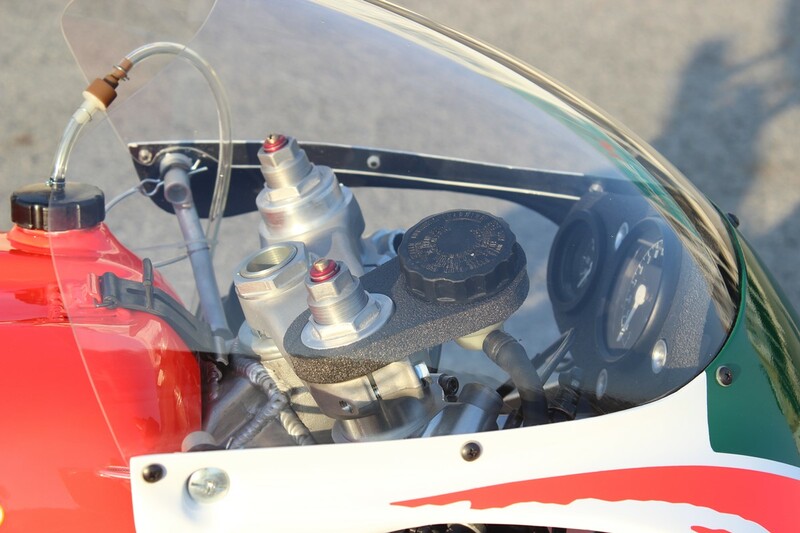 In the early 1980s, there was first the ND5 which evolved to be the NF5 with ATAC valves in 1987. 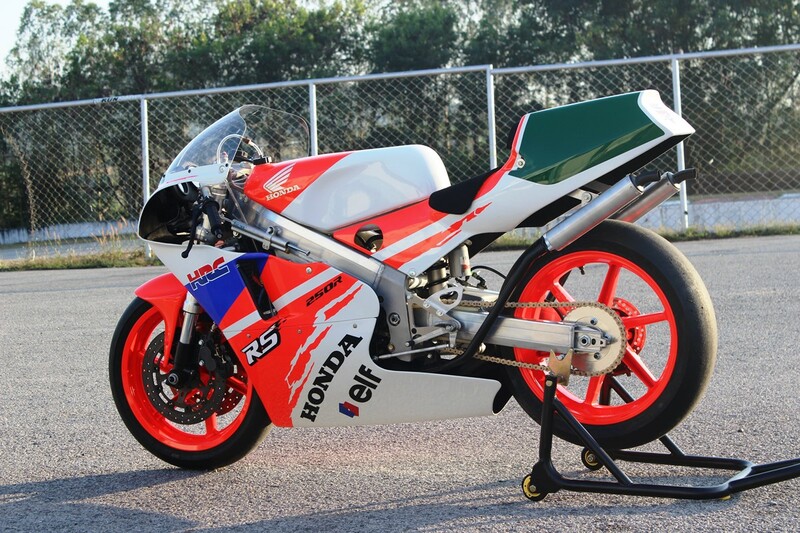 This model had small but significant changes almost every year and on this page we feature two NF5s to honour the glory days of HRC and the two stroke era of GP racing. 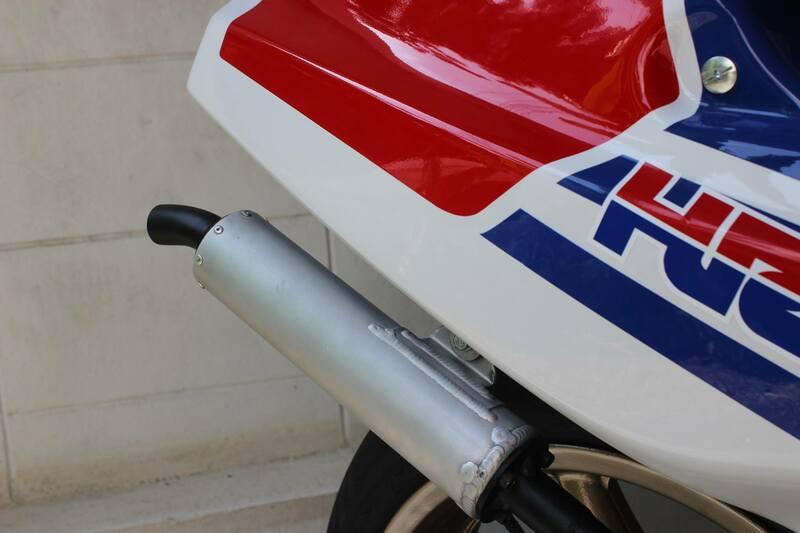 The older model of the two shown here in blue is a 1988 model which was an update of the 1987 with important improvements such as the RC exhaust technology in place of the ATAC. It weighed in at 104 kg and rated at 76 PS (at the brochure!). 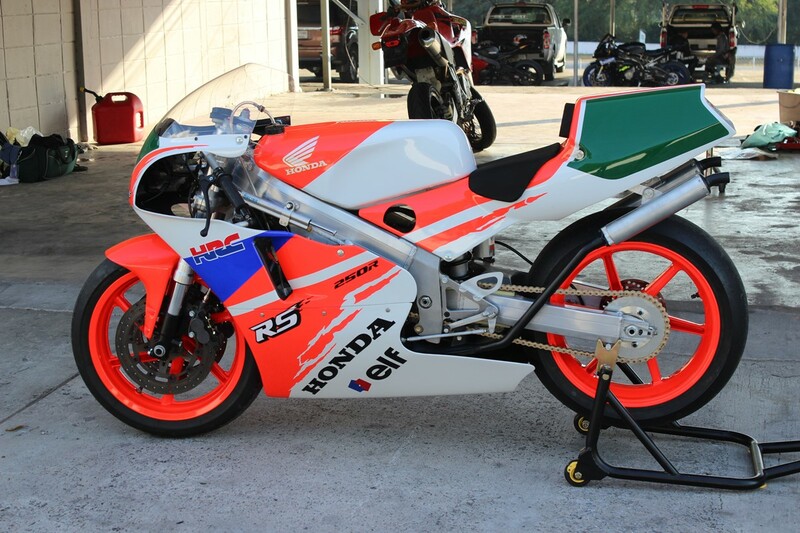 The major upgrade for the NF5 series came in 1990 like the second orange bike here) with a new frame and the model then continued to evolve producing more power until finishing up at solid 82PS at 12,000 rpm in 1992. 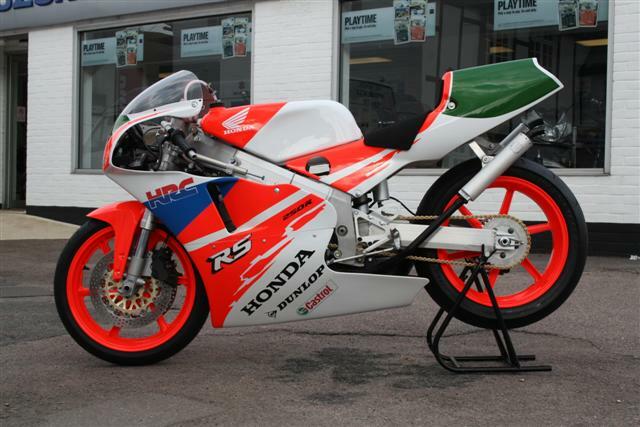 In that year, it also ran upside down front forks, bigger reed valves and had staggered pipes and new bodywork. It also ran a 5.25 17 inch rear wheel. 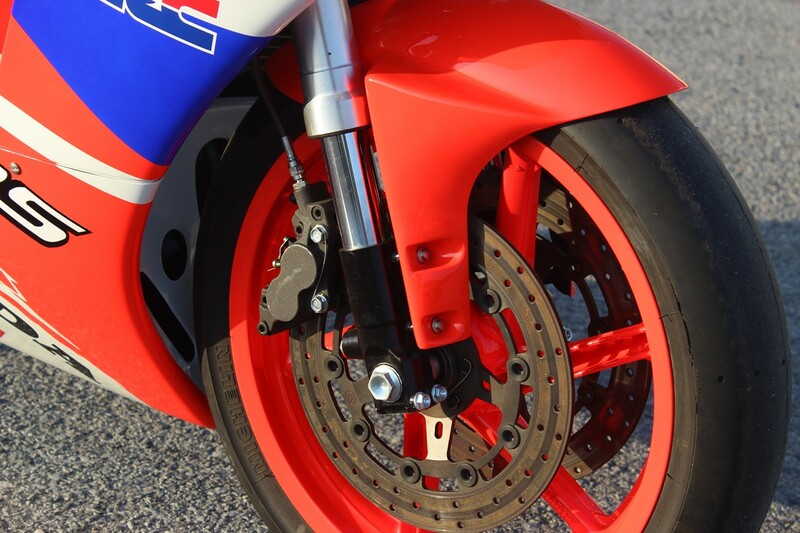 You’ll notice that although our bike is a 1990 model it has several upgrades from the 1992 model including the front forks, bodywork and rear Showa suspension and we will explain later. 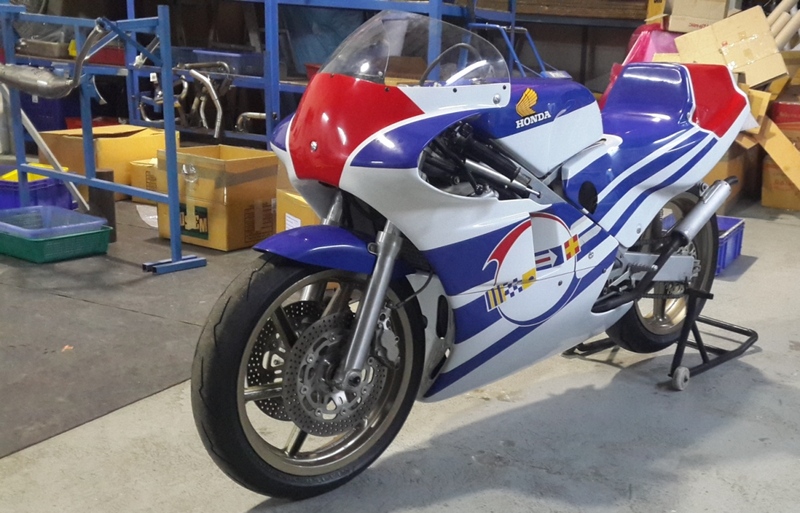 A little introduction on the 1990 model; this bike was imported to Thailand from Japan about 15 years ago and lived in Bangkok for a while. 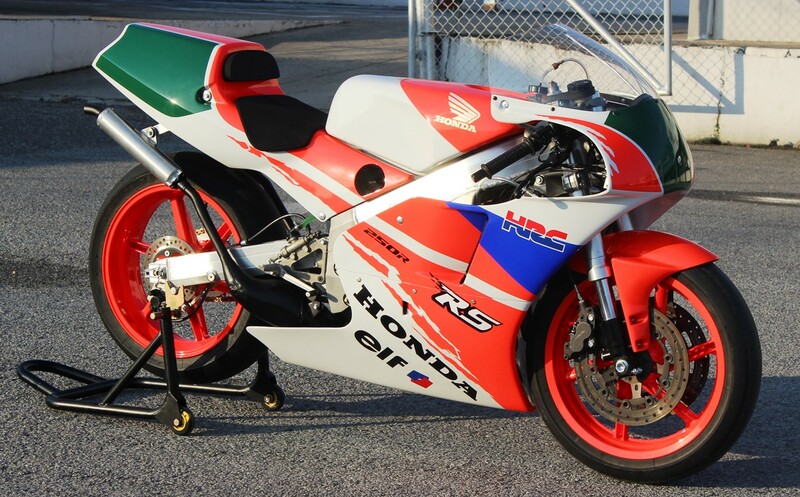 The owner used to ride it occasionally at the long gone circuit behind Seacon Square where he stored it. After a while, he decided to sell it and we at TYGA were offered first refusal. I would shock you if I told you his asking price, and even at the lower prices RS250s fetched then, it was ridiculously cheap (less than a price of a scooter). Now seeing as it ran and was more or less complete, I didn’t complain about the incorrect rear wheel and a bit of corrosion here and there. So we loaded it into the truck and put it in the garage for a year or two. 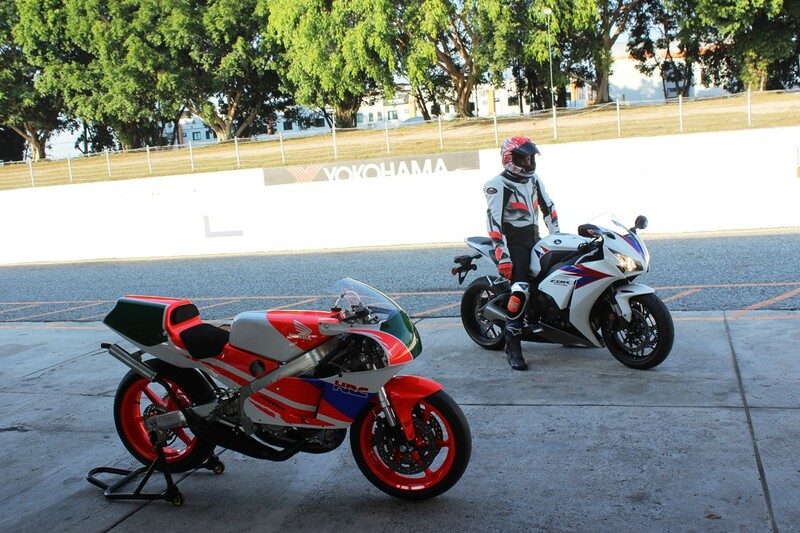 The next chapter was a Pirelli track day at Bira Circuit in 2009. For this event, TYGA rolled out two NX5s in TYGA bodywork and colours and just for fun, it was decided to get the old NF5 ready for the day too. 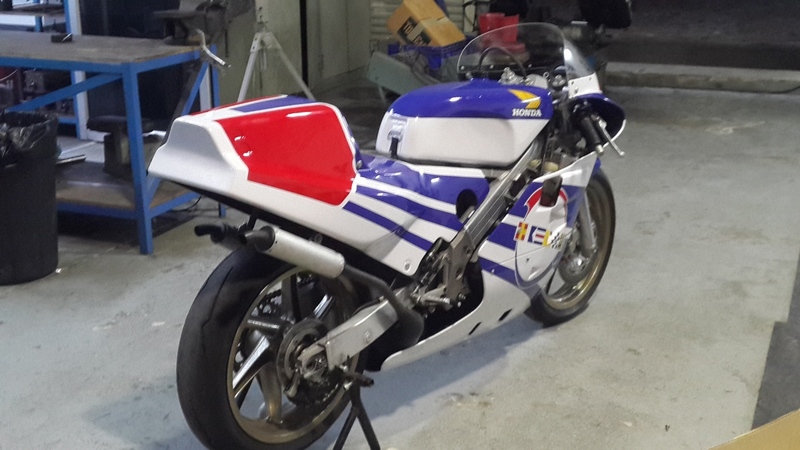 Some old TYGA GP fairings were grafted on, the motor started; Matt dug a fingernail into the tyres and declared the old girl fit for service! 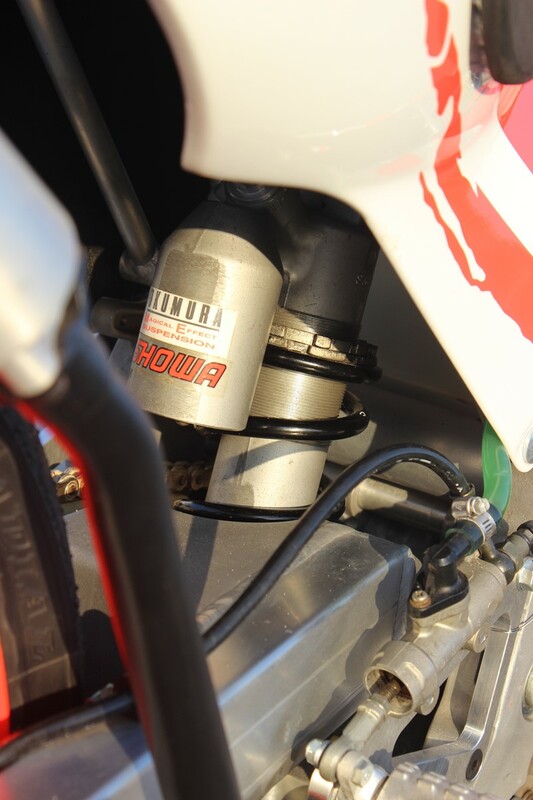 So off to the track it was for the ancient two stroke. Matt took the NF5 out for a few laps easily keeping up with the modern superbikes in the advanced group and signed it off as safe to ride for a newbie like me. I must admit I was petrified. 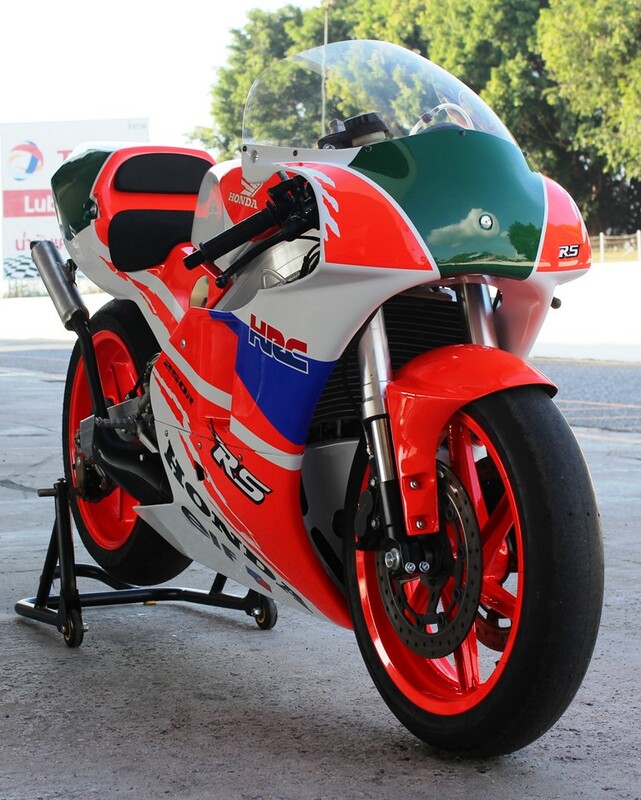 It had been several years since I had been on a race track, and although I’ve ridden GP bikes around the paddock or places where they are not supposed to be ridden, I’ve never actually ridden one in anger on a closed circuit. So anyway, I didn’t want to let the side down, off I went (in the intermediate group) and… let the side down. First thing was the bike is tiny and I really couldn’t hardly fit in it. 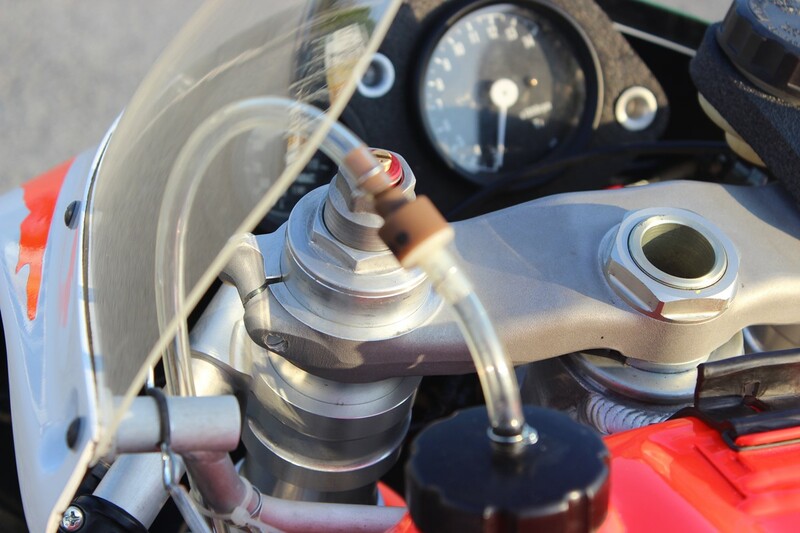 Secondly, the race shift got me every time and unlike most bikes which do have a bit of power either side of the sweet spot, the RS doesn’t so if you change up instead of down, you immediately fall out the power band and need to scramble through another two or three shifts to get going again. This was particularly disastrous after exiting the first fast left and going up the hill. As a fellow rider I remember mocked me, ‘what else have you got in your bag of excuses Paul?’ Anyway, not a day for glory for me or the RS, though I can’t blame the bike to be fair. So off it went back into storage and it sat there languishing for a few more years. 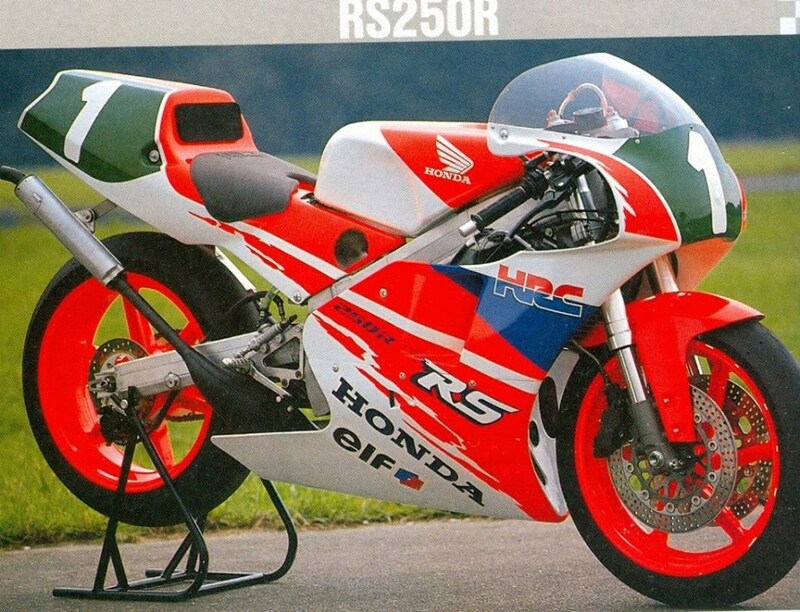 I must admit, we all preferred NX5s and NSR250s to the NF5. I think its unloved and corroded appearance didn’t help its case much either. I couldn’t really imagine it turning into anything beautiful or desirable. How wrong I was! After talking to various people such as Steve A’lee at GT Performance, it seemed like the value of NF5s was on the up and up and these models were now highly sought after by collectors and those wanting to parade something a bit different to the norm. We even had one of our regular customers try and buy it on several occasions which obviously made us sit up and think about its desirability. 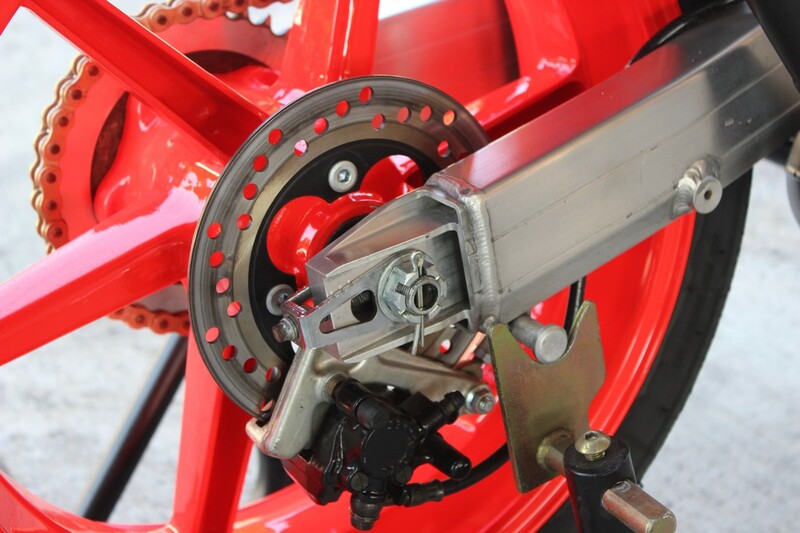 The final thing that sparked us into action was inspiration drawn from St Neots Motorcycles in the UK who restored a 1992 to a standard I hadn’t thought possible. Well, if they can do it, maybe we can too. The NF5 deserves more love and a second chance. It also made good business sense as we could invest in the now valuable bike without feeling guilty about spending the money. 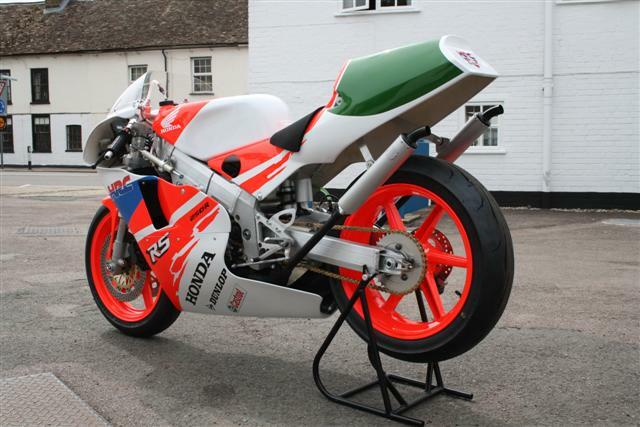 Now, I know bikes are worth more when they are all original but you know us and we can’t leave anything alone. 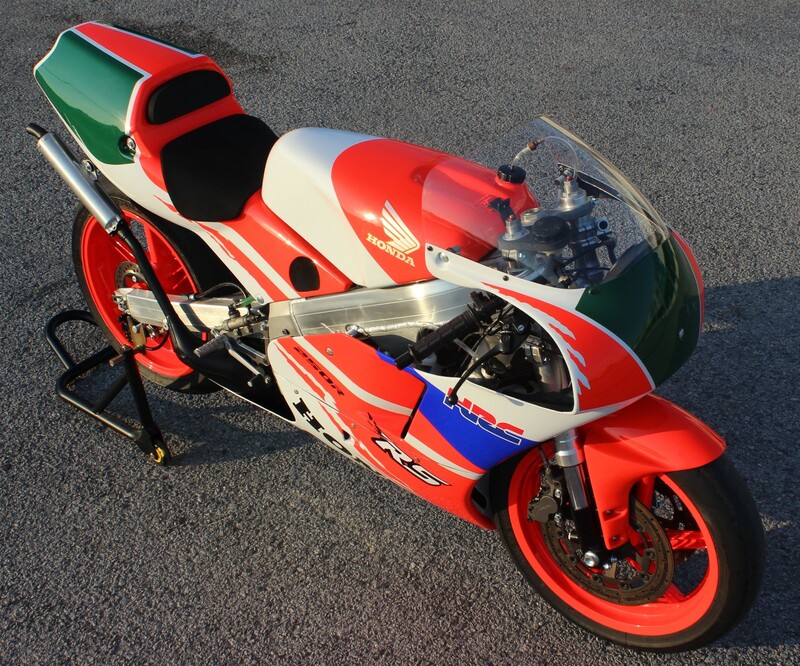 We really liked the look of the St Neots bike but our one was a 1990 model and their one a 1992 and the only way to get ours to look as good as theirs would be to acquire some 1992 bodywork and stick an upside down front end on it too. As it happened, we had recently sold a 1992 front end so we quickly phoned up the customer and asked him if he could swap it with us for an NX5 front end. 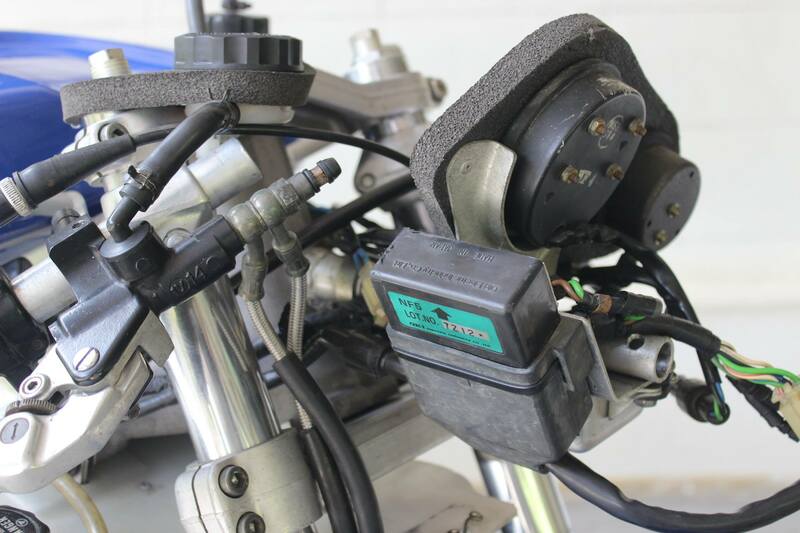 As he was planning on using it on an NSR250, he was happy to do the swap. For the bodywork, we contacted St Neots and they were able to order up the 1992 bodywork as there was no local source here. 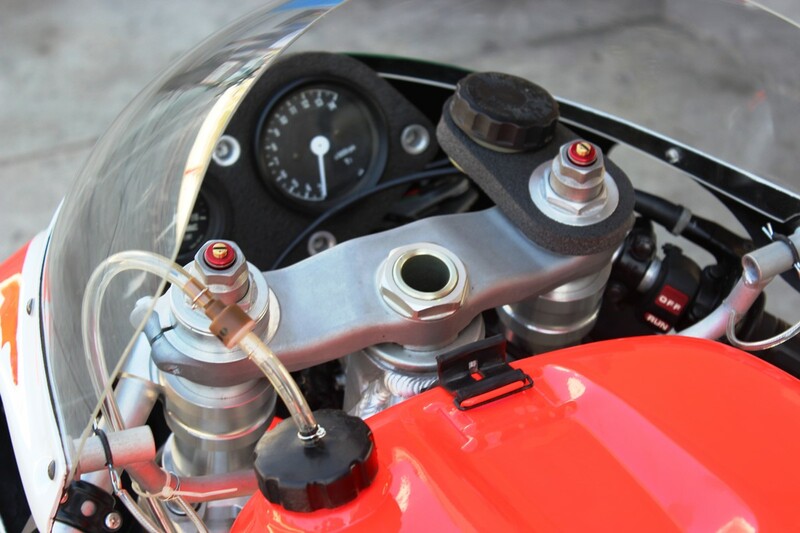 The bodywork arrived and the bike continued to sit there for several months with the same persistent customer continued asking me on several occasions to sell it to him as it was so neglected. It was difficult to come up with a good excuse not to sell it unless we actually restored it, so it was finally time to give it the TYGA treatment. I decided to do this as an after-hours project in my house instead of the factory where we do most of the projects. The rationale was that it would be something to do in the evenings when I have a few minutes or an hour or two to spare. So we loaded it in the van and drove it to my house and straight into my spare room. 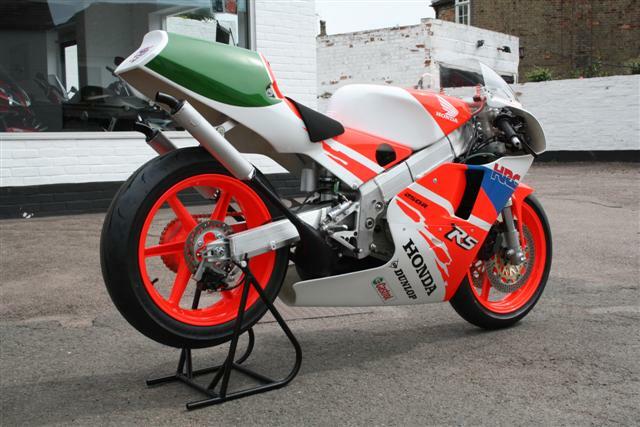 As anyone who has owned one will know, a GP bike can be quickly stripped and in no time at all, I had the bike in bits all over the floor. Lucky for me, I have a sympathetic partner. She reigned herself to the situation right away. Actually, the trick is to be in the habit of doing this type of thing before you get the partner and then she can’t prevent you from doing boys stuff in the house once she’s moved in! So although we don’t have any before and after pictures, I did take some photos of parts as they were stripped so I knew which parts went with which and in what order, (not that it is too difficult).. The bike was in surprisingly good condition under the grime and corrosion and I didn’t find anything any nasty surprises at all. Now came the hard work. 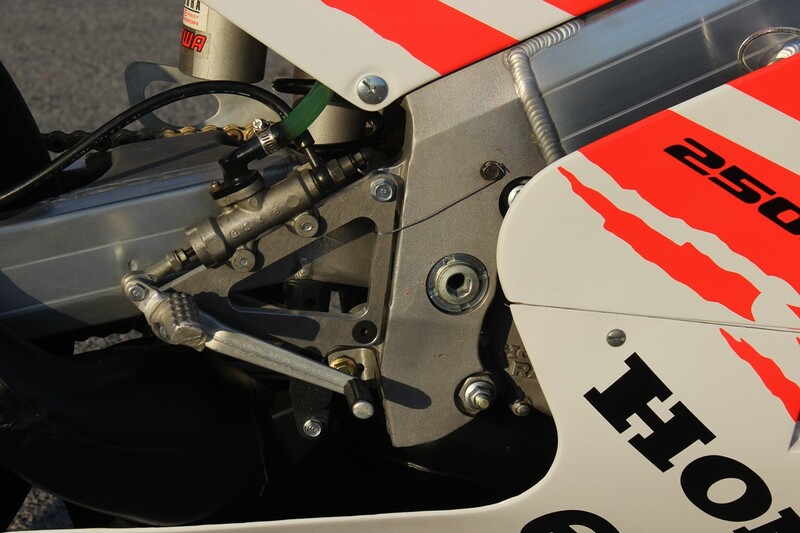 Unlike road bikes, Honda didn’t anodize their frames and swing arms on their GP bikes and as a result, they are supposed to lovingly cared for and scotchbite finished at every meeting to keep in good condition. The problem is that too many have been parked for years in damp conditions and this results in fur and pitting in equal measure. The only way to get rid of this corrosion is to use good old fashioned elbow grease. So starting with rough wet and dry, I sanded the frame until the pitting was gone. Of course you have to be careful to sand the same direction parallel to the spars or you get swirls and you need to avoid welds and the castings or it will look terrible. By going down in grit size, I was able to reproduce the original finish when new with only a few minor blemishes being visible when I’d finished. Quite a massive improvement! For all the nuts and bolts and fasteners, I was just going to clean them up and put them back on the bike but after looking at the St Neots bike again, I realized that it wasn’t going to be good enough, so they all went off to anodizing. 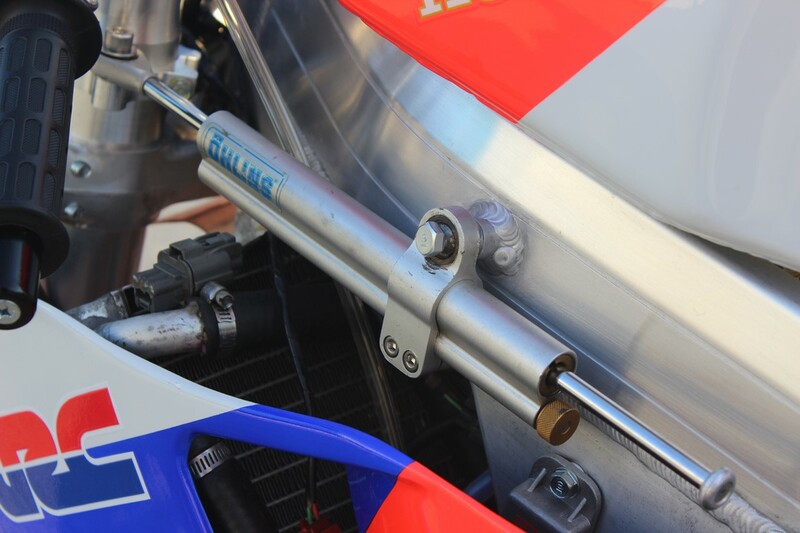 In the meantime, we ordered as many new parts as we could from HRC. 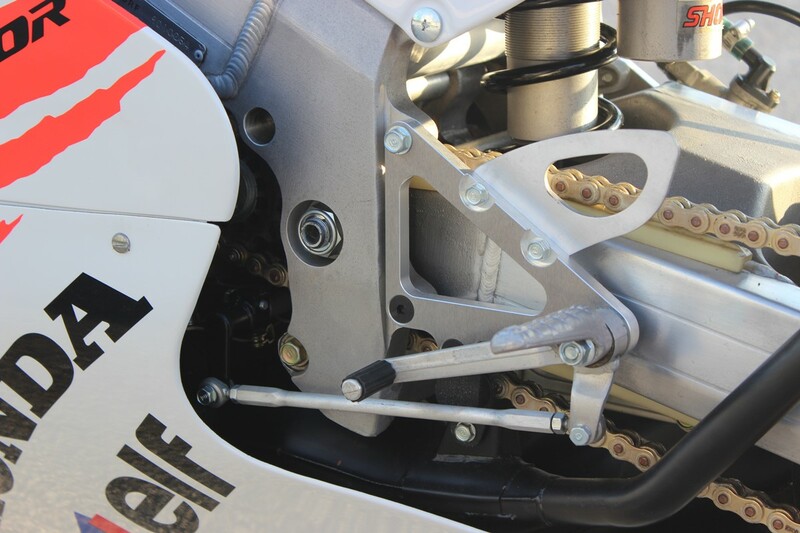 This was depressingly few and consisted mainly of generic bolts and a few items used on the more abundant NF4 RS125. Well, at least it was better than nothing. Some things such as new tacho, we had in our private stock for just such an occasion and we were thankful to have this and a few other bits and pieces Matt had squirrelled away. 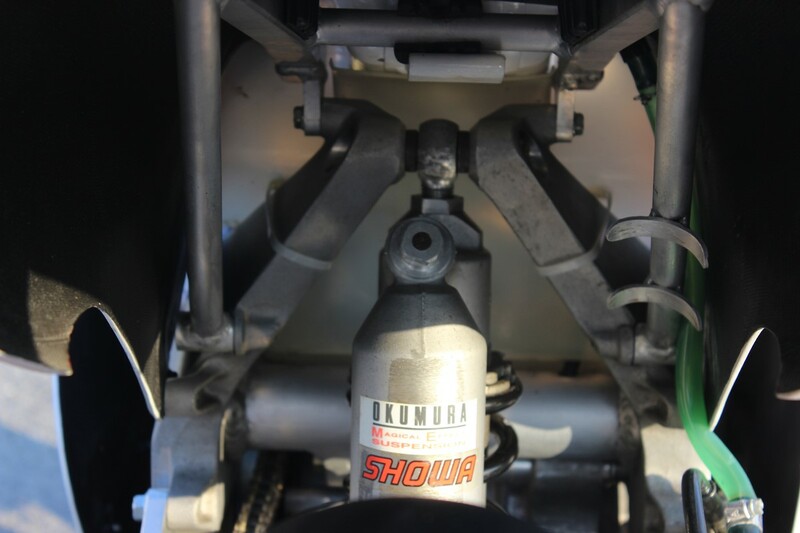 While looking for parts, he came across a 1992 rear shock which has the gas reservoir cast on the cylinder so that was a nice find too. 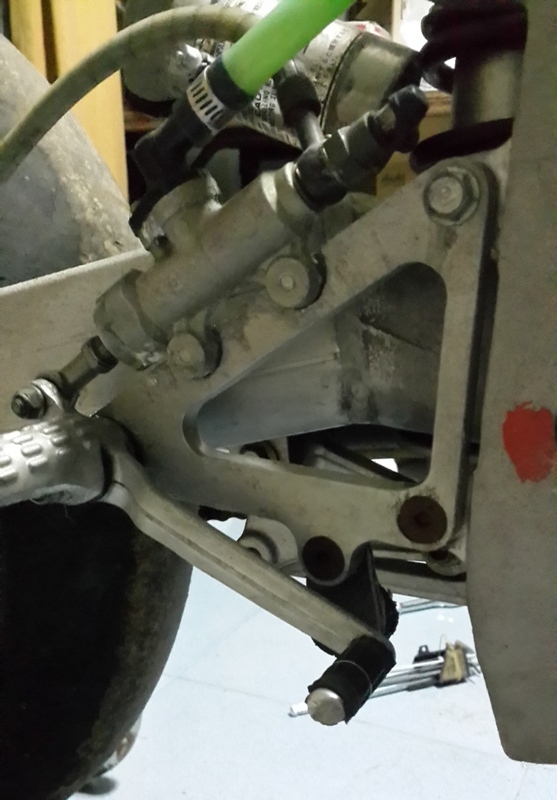 The foot peg hangers were bashed around and really beyond economic repair. Matt to the rescue again. 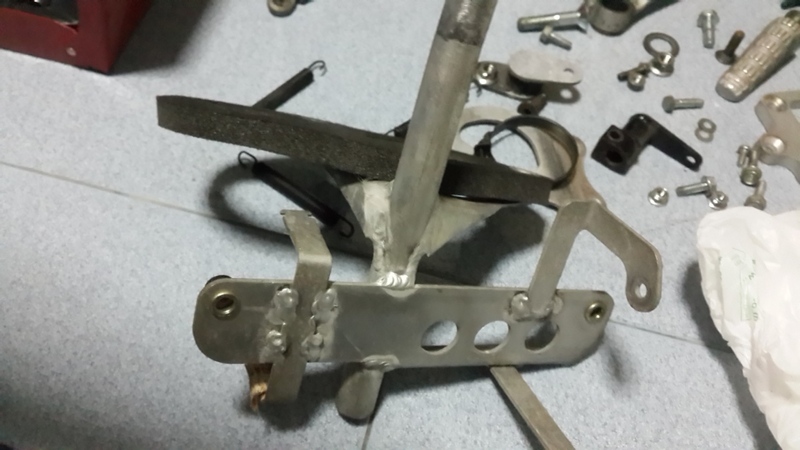 This time, he found some aluminium stock and made some replacement hangers on the CNC machine, being careful to retain the grained finish of the originals. 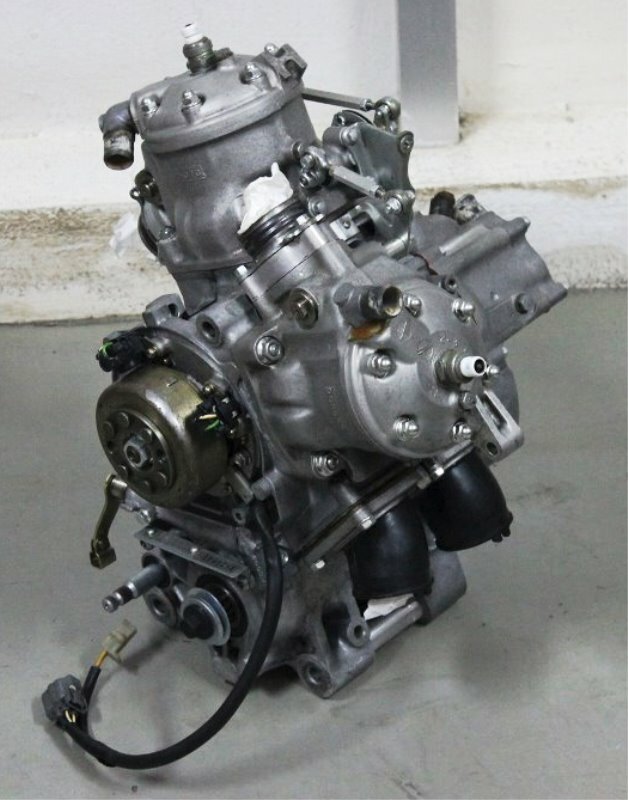 You will find a small range of TYGA-Performance products for the NF5 and NX5 here. A bigger job was the engine. Matt was in his element and stripped down the motor and rebuilt it with a new top end, clutch plates, and bearings. I had the job of cleaning the individual components and the difference between before and after was very satisfying and well worth the effort. 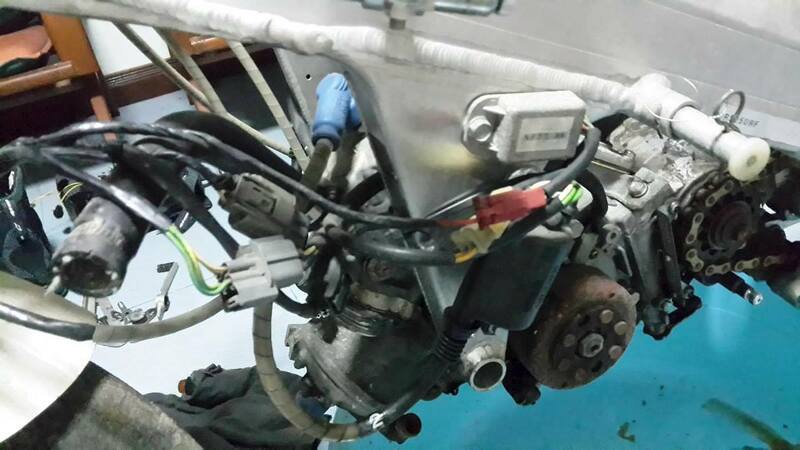 We were lucky the motor was in good condition. 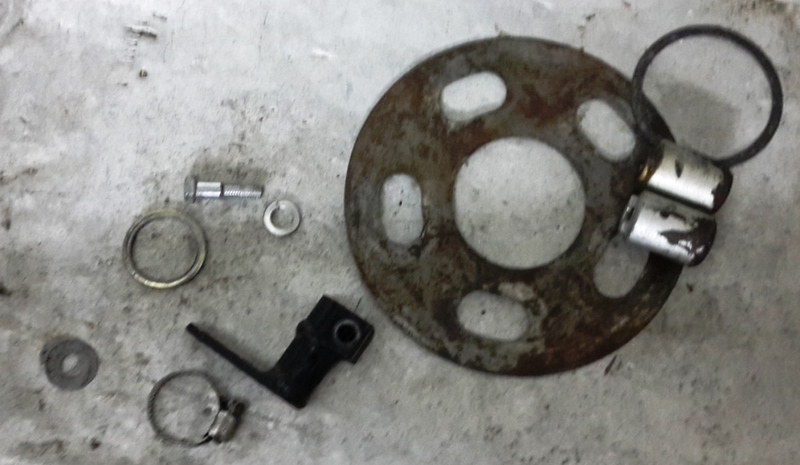 Crankshafts are now getting very hard to find. The bodywork was not a simple install. 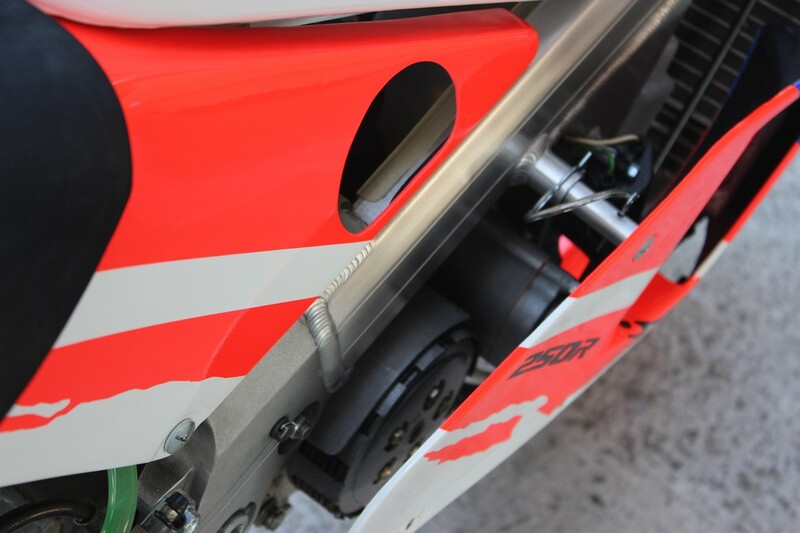 Like many fairings, it required quite a bit of fettling to get a good fit. We have the right team here so once Thanet was satisfied that everything was ready, it was sent off to K Pong for paint. At the same time, we sent off the wheels to be painted too. The front is the original one that came with the bike but the rear was a 5.25 inch RS Magtek one we had in storage to replace the 3 spoker that came with the bike. There was no doubt in my mind which paint scheme to apply to the bike. 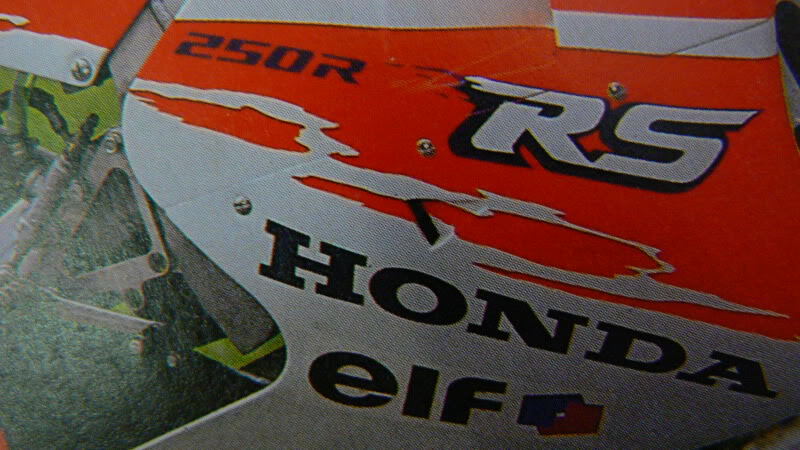 The 1992 brochure colours in the correct bright orange was definitely the way to go. I know some people like the plain white HRC as delivered look and I can see that on some models it looks nice but the brochure colours really made the NF5 come alive and look a lot less blocker. Paintwork was done by K Pong using some photos we got off the internet of the original brochure and publicity shots. Surprisingly, there were very few clear shots of the top and rear and we struggled a bit at first. 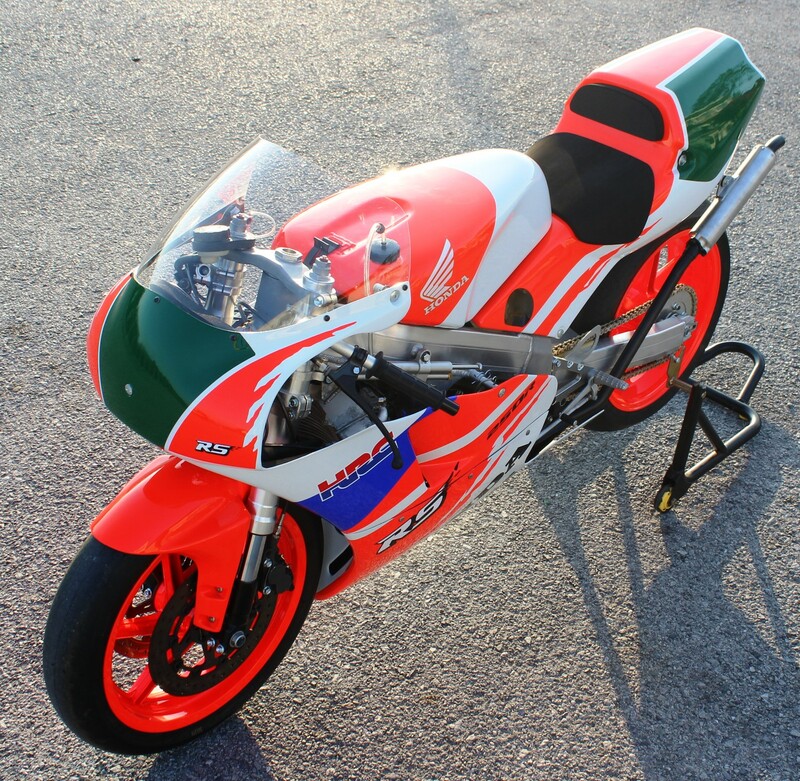 Pieter made us some graphics in an assortment of sizes, and because this is a race bike, the lettering was applied after clear coating. 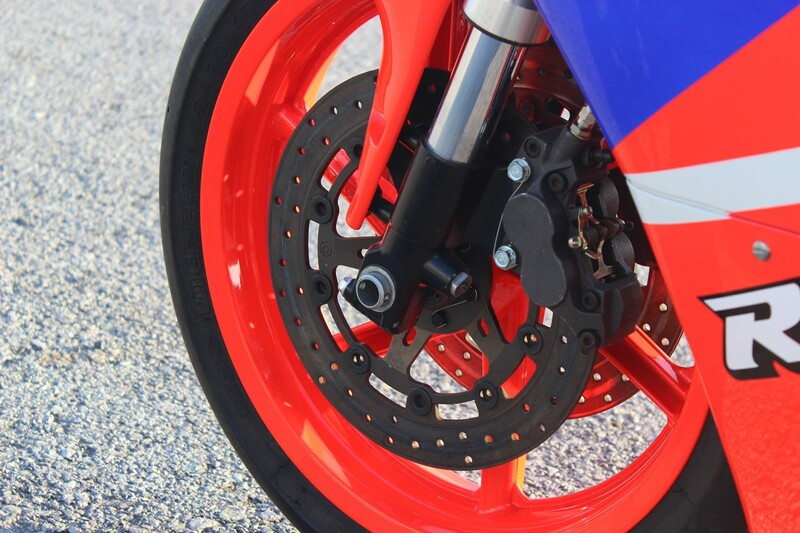 We were not overly concerned about them decals peeling off as the bike is likely to have little use and even less washing which is the usual culprit when it comes to decals coming loose. One surprising and unexpected issue was finding tyres which would fit. 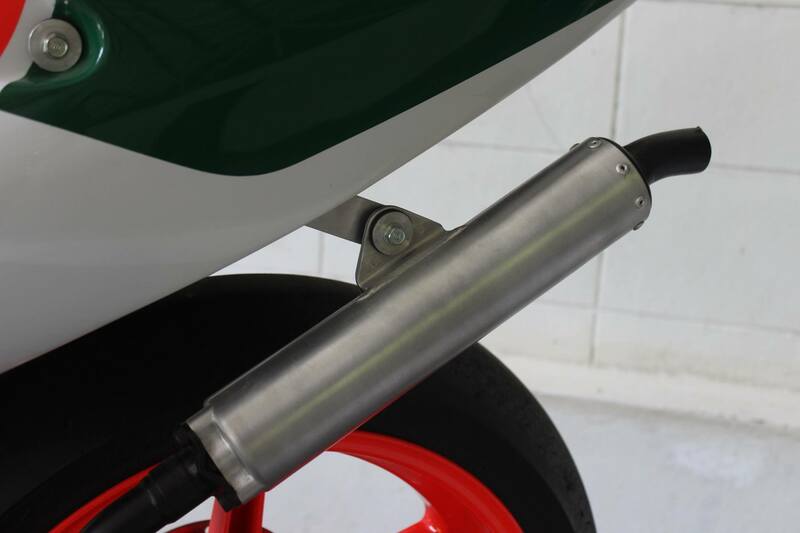 The rear one we fitted at first was too wide for the swing arm and by switching to a Dunlop we were able to get it to fit with a safe enough gap either side. 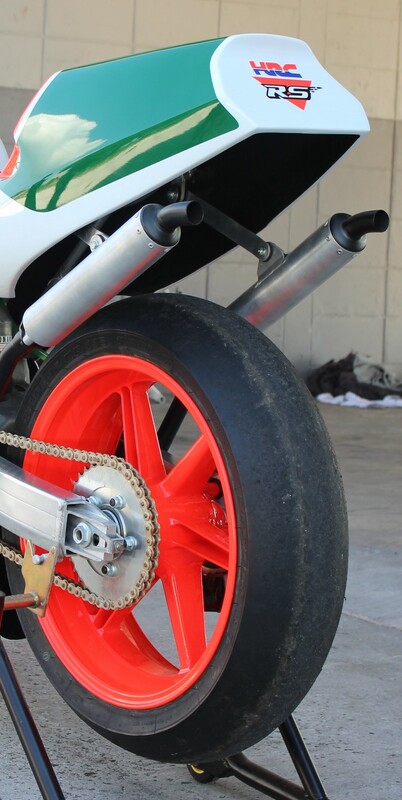 The front tyre was also an issue. 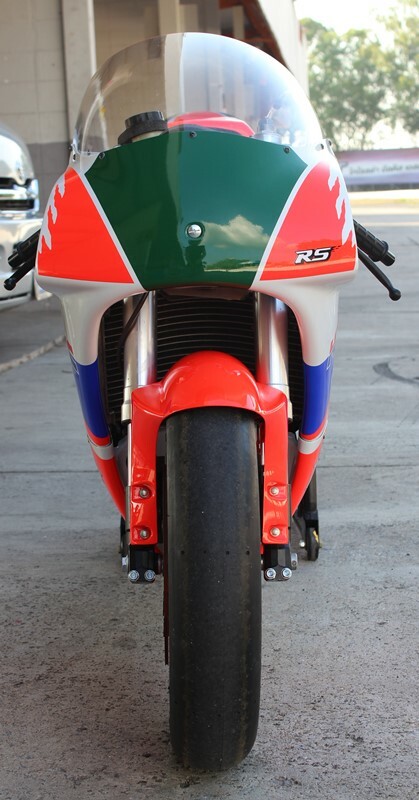 Back in the day, you could get a lower profile front but nowadays there are only high profile superbike fitment slicks available in most places and they will rub on the inner cowling. Luckily we looked through our collection and found a used lower 60 section slick (possibly the original one it had on to start with) and it fitted no problem. Of course it is a bit hard now and more for display purposes than setting pole! So gradually the bike was reassembled like some 1.1 scale Tamiya kit. By this time, I had given up on working on it at home with too many distractions and not enough tools and the bike gradually took shape in my office. 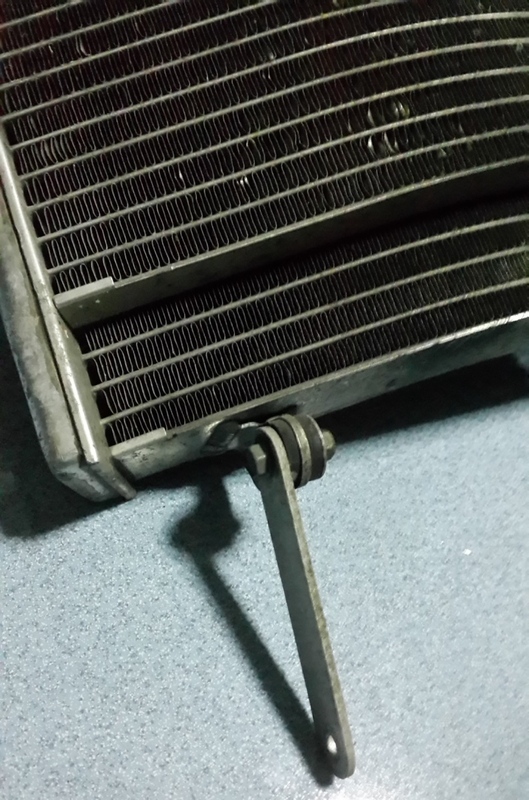 The reassembly went to together smoothly enough and care was taken not to rush the job. It is easy to get overly excited but you have to remind yourself it is not a race. Eventually it came time to start up the NF5 and it only took third push for it to fire into life. 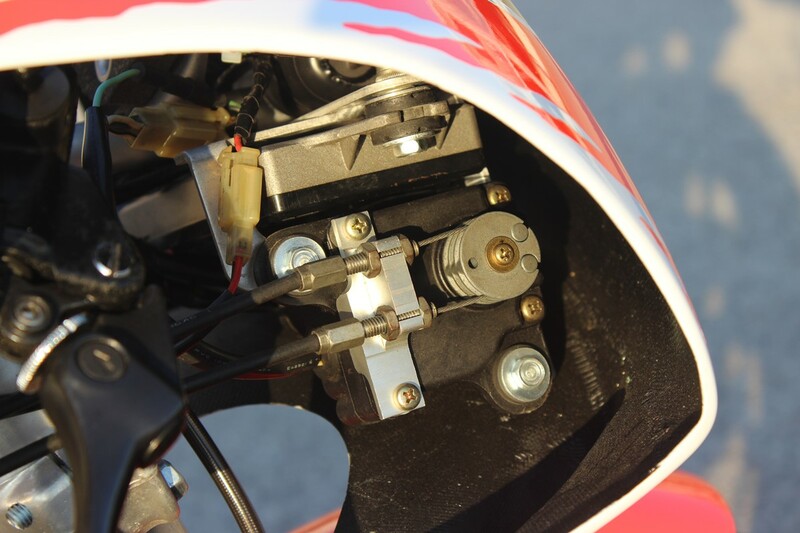 Matt then set up the RC valves and the bike was now ready for running. it was loaded back in the van. For a year it was displayed in my office but with new projects needing to fill the space, it has now been relocated to my living room. I would say more days than not, I spend a moment or two to admire its beauty. I can’t believe how in the early years it just didn’t do it for me. 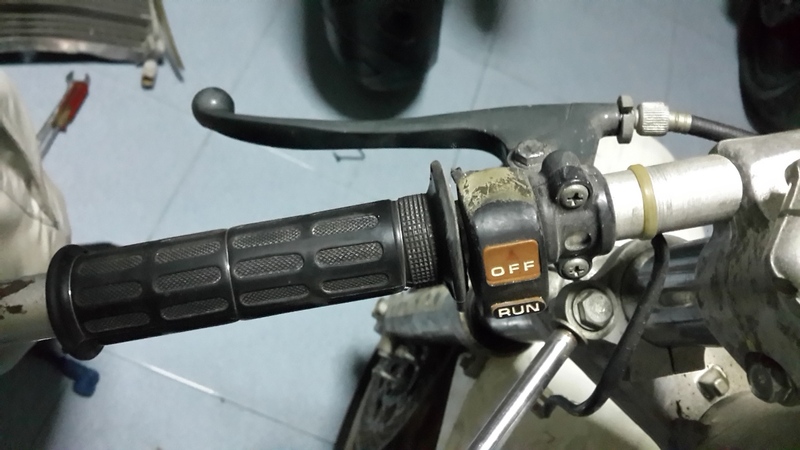 It just goes to prove that you should never sell a bike or you will surely regret it. Much better to give it some love and attention and the rewards will be, well, a valuable and appreciating piece of art. As for the second NF5 here, well, we haven’t restored it properly yet so apart from the cosmetics which you can see are all in order, there isn’t so much to say, yet! 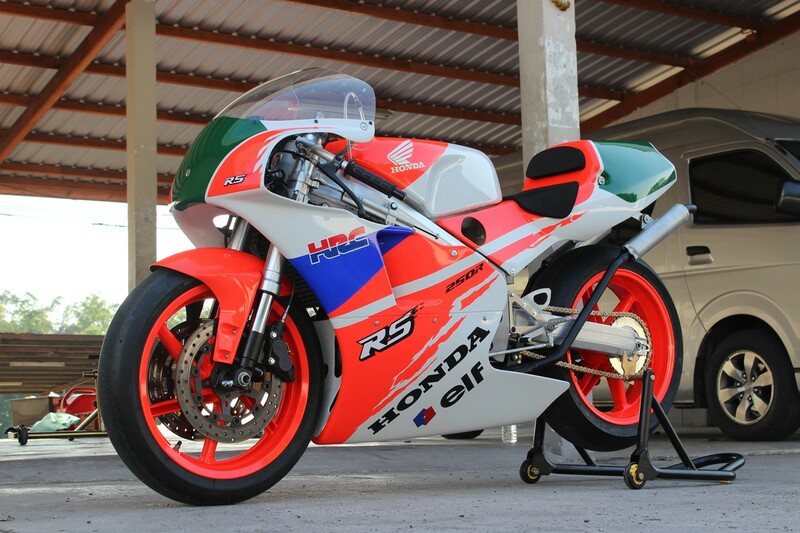 The bike is a 1989 NF5 which was acquired by a local track day and part time racer around 3 or 4 years ago. 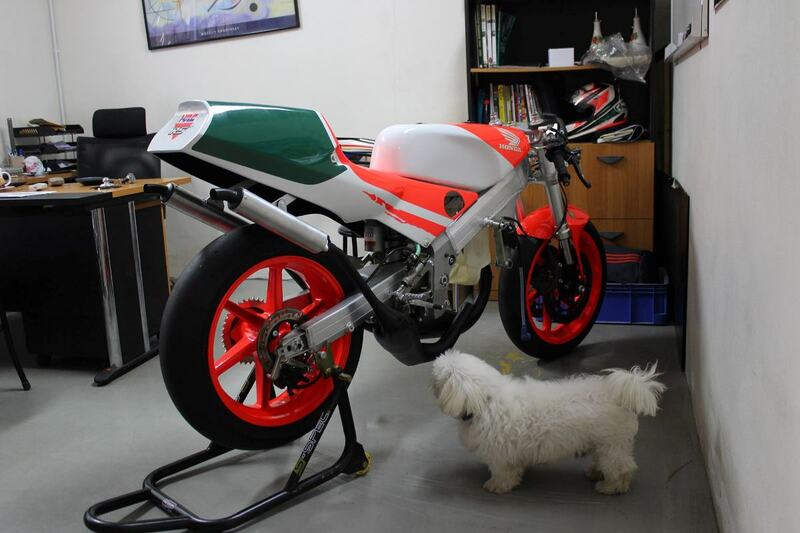 He is of a certain age and loves his two strokes and specially imported this one from Japan. When we saw it at the circuit, we were amazed at the condition and originality given its vintage and immediately tried to negotiate a sale. The owner was not interested in our ever increasing offers and we had admit defeat. 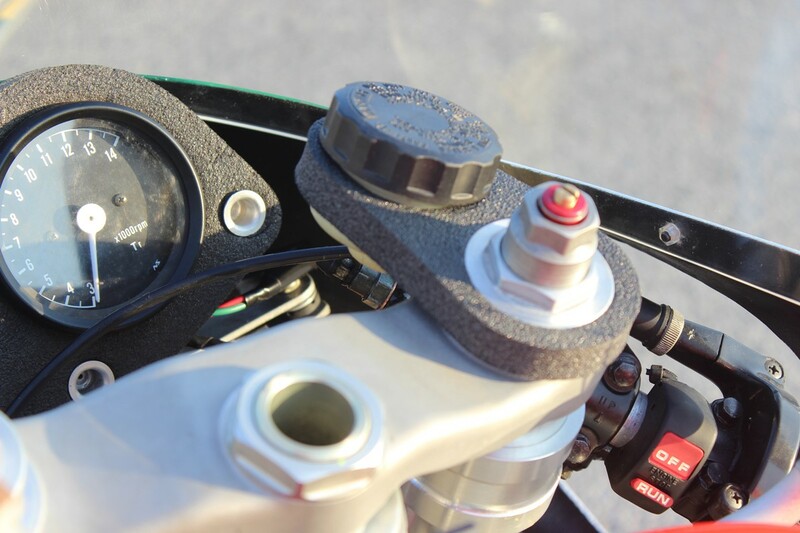 We saw it from time to time at track days and then of all things, it next appeared on the drag racing scene! The bike had been sold to another owner and that was his thing. 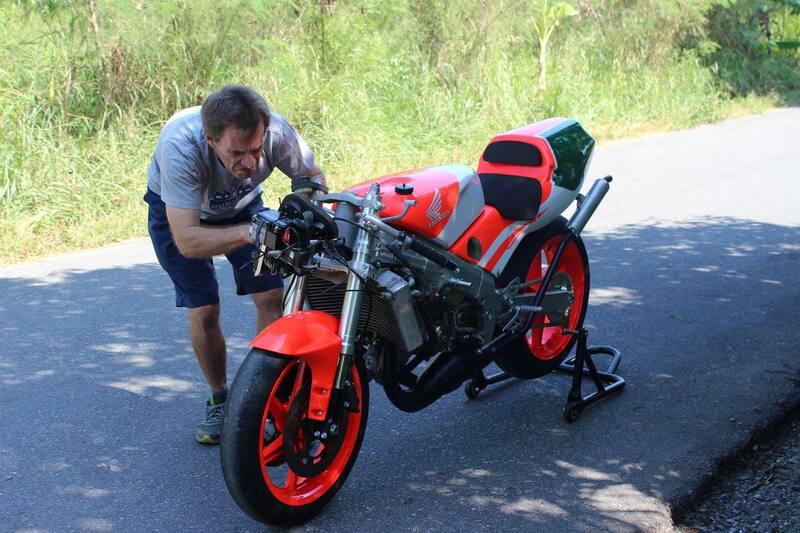 As we all know a 250 GP bike is not really designed for this sort of racing and although Matt tried his best to offer advice on set up etc, it was never going to set records in this new career. It did obviously attract a lot of attention and you can see it in the video below on full charge. 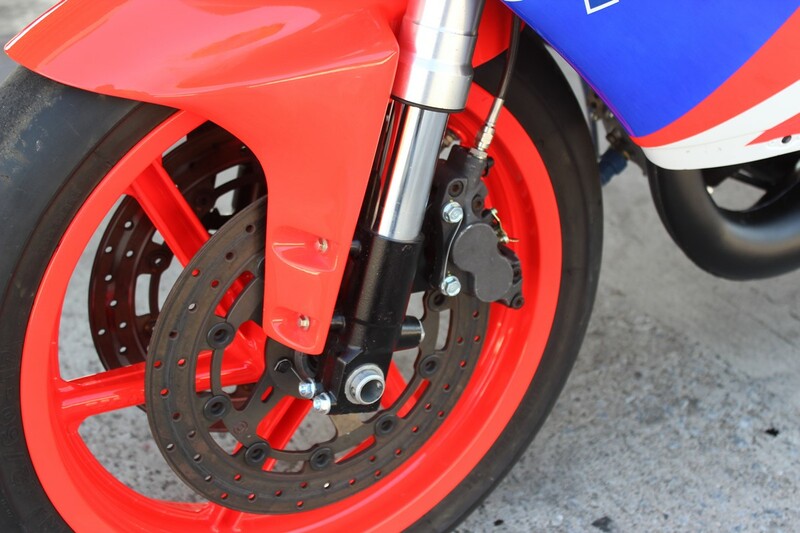 When we first received it, the rear wheel was a 17 inch MC21 version but we have changed it to the correct 18 incher. 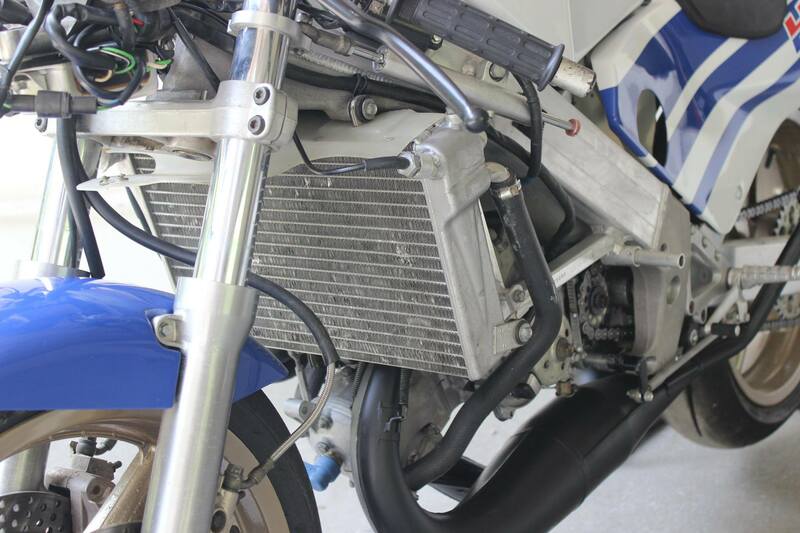 We still have to source some other parts but for now it runs and looks the part so we thought it a good idea to post pictures of both bikes together so we can compare their similarities and differences. 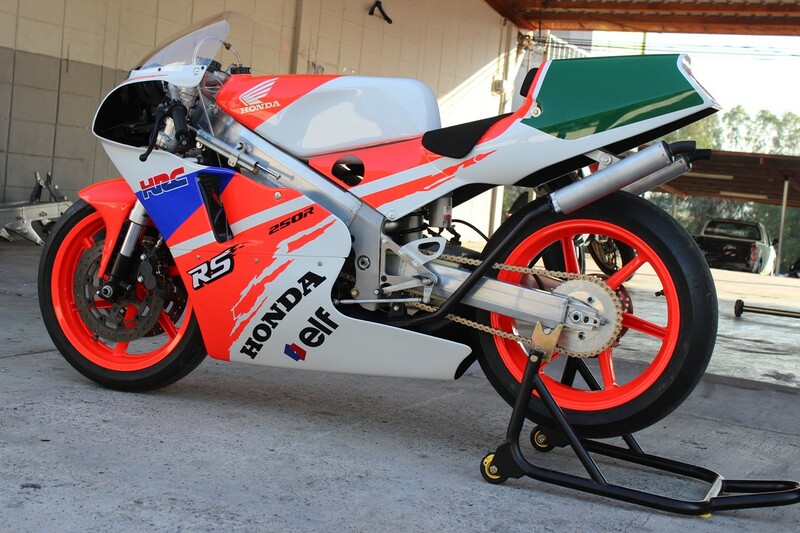 When you consider that they were made only 3 years apart (ok the 1990 has some 1992 parts on it), they are very different in a lot of ways (chassis, engine, fuel tank, bodywork, electrics etc. etc.) 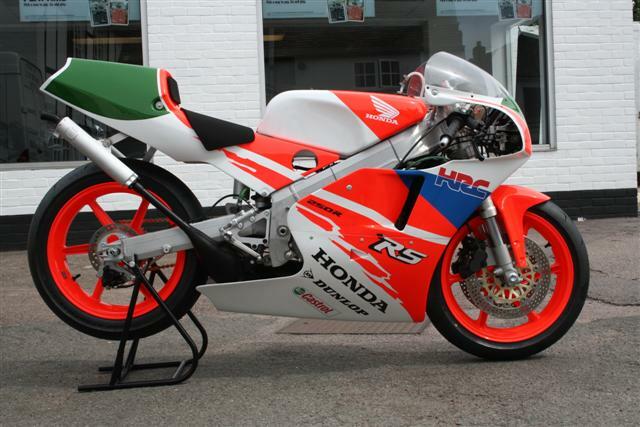 and show just how much effort Honda were constantly putting into their GP bikes at this time to keep them competitive. 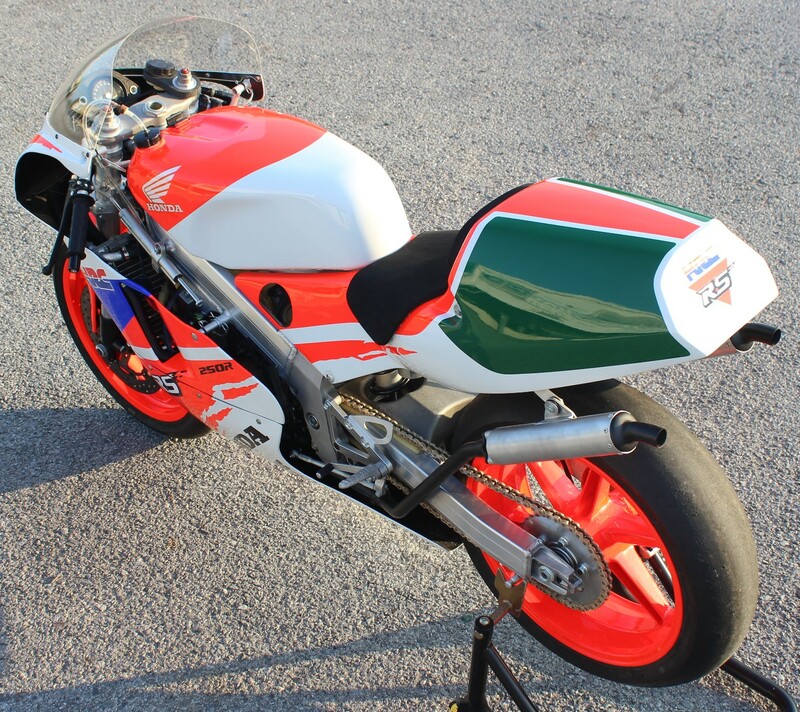 Just a word on the paintwork, of course this is not strictly accurate for an RS250 to be in Terra Racing colours but it is period and I hope you will agree with us that it does make the bike look like a proper GP bike from the late 1980s. 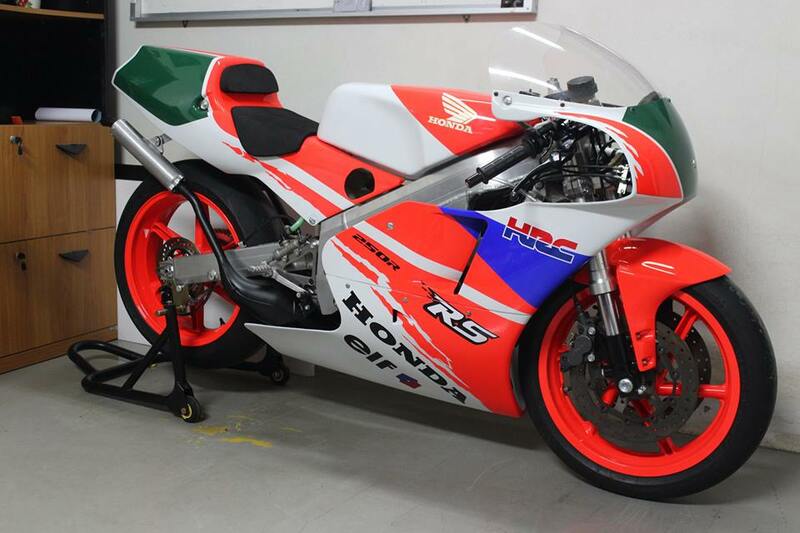 The exact inspiration for this scheme came from 1989 NSR250 of Masahira Shimizu though it needed some tweaking to fit the RS bodywork. We used the full team here at TYGA (and more) to get the job done! 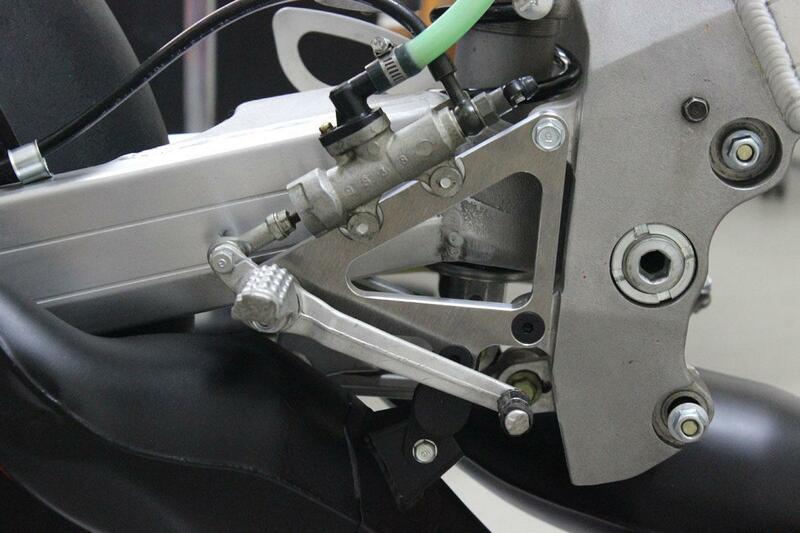 First, Thanet repaired the fairings to an as new or better than new standard. When we first got the bike, there were pools of resin and bird’s nests of chopped strand mat inside it where someone had attempted a repair. Now you can’t see it was ever repaired at all. It was all carefully ground back and a layer of 200 gram glass fabric laminated inside. The panels are actually very good quality for their vintage and fit well. 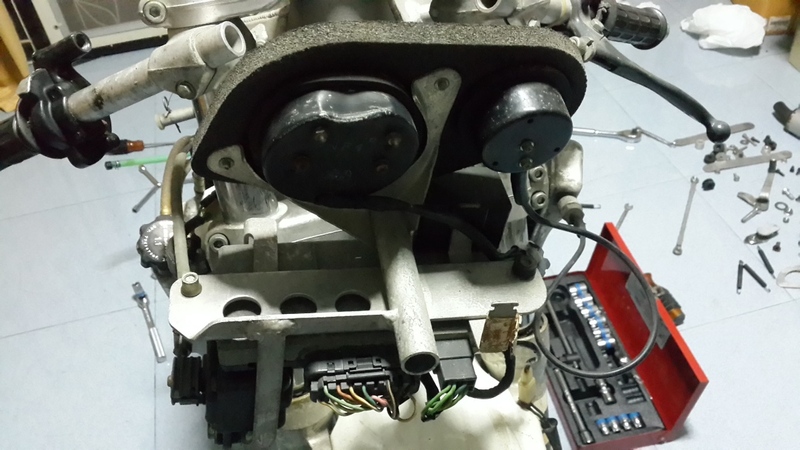 We removed the ¼ turn fasteners and sent the bodywork and tank off to Pong to work his magic. In the meantime, Matt got in touch with Andy at NSR World who had the signal flags etc. 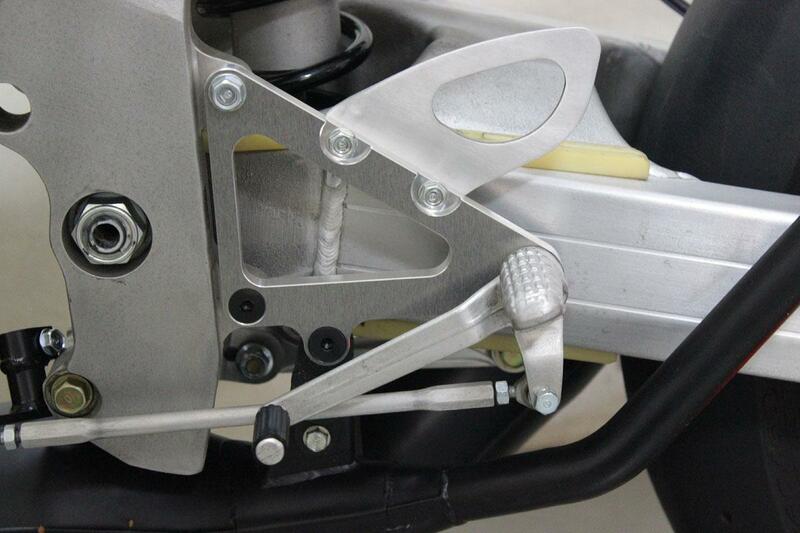 for the Terra Racing in a file format and Matt was able to work with our sticker guy and Pong to get them reproduced. 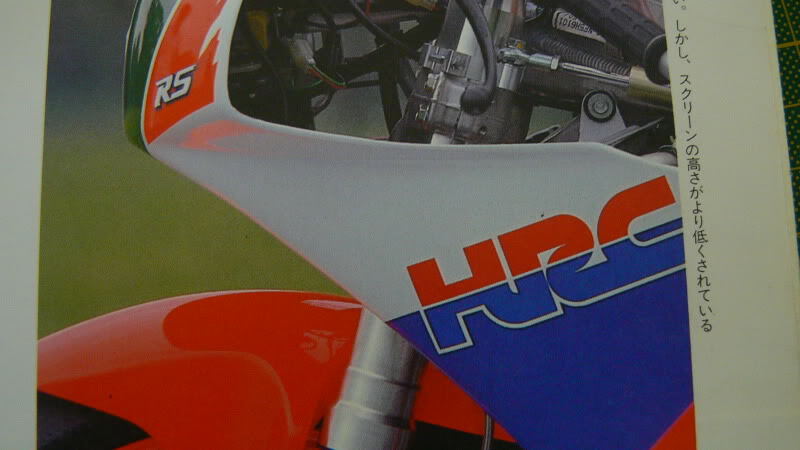 OE wings from Honda (RC30) were used to give it the old school look, even though this did actually deviate from the Shimizu scheme. The Terra scheme is actually quite challenging, mostly because all the lines on the various panels have to line up exactly and be the correct angle or it will look really awful. 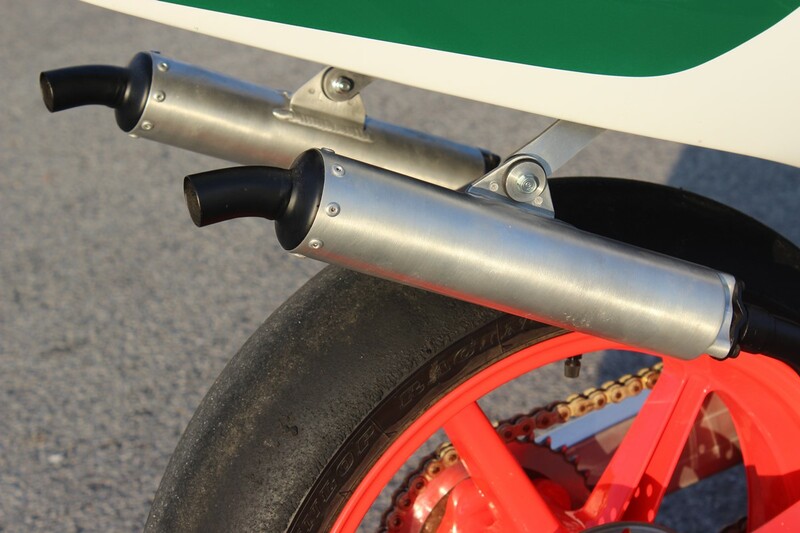 We used masking tape with the panels assembled on the bike to get these as correct as we could. The paint was then finished off and clearcoat applied. We then put the graphics on over the clearcoat for the factory look. The air ducts in the side were annoying in that they got in the way of the Terra font but I think we sussed it in the end by trying different size fonts until we found something that doesn’t disappear in the air ducts and still be clearly read. 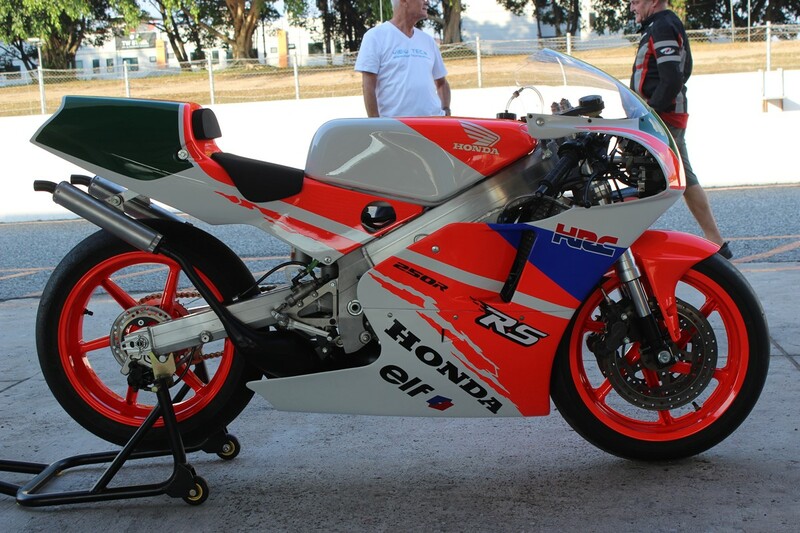 When we first got the bike, the front fairing looked all weird and out of shape. We offered up the NF5 upper stays we already make for the 1990 model and luckily they were an exact fit. Then we looked at the ‘bubble’ as the racers these days like to say, and it really was a bubble. 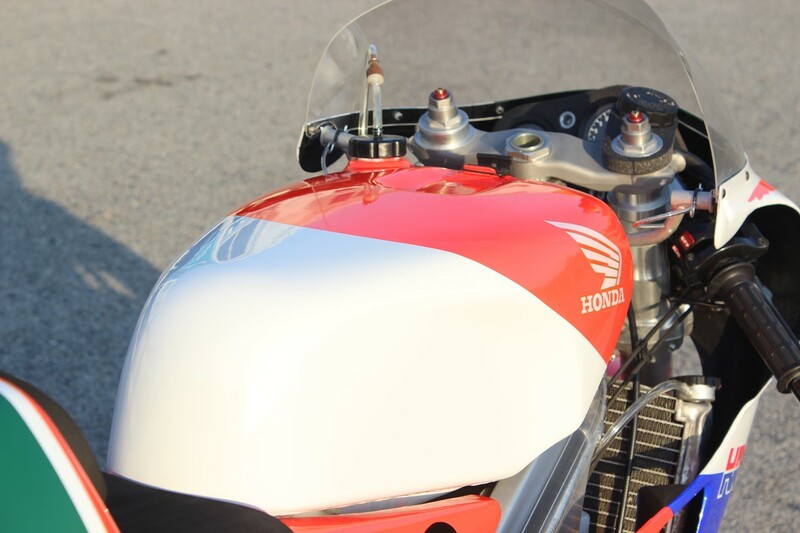 By throwing that one away and going through our extensive range, we found a cut down RC30 windscreen could be made to fit very well indeed and that is what you see here.